Last month, I invited you to an armchair stroll, an afternoon of art, as I shared some of the photos I'd taken of beautiful paintings and sculptures from the Dayton Institute of Art's collection. This month, as promised, I'm posting more from the Institute, but only images from their Georgian or Regency Era collections. Wood with mahogany veneer, marble top, alabaster columns, gilt bronze ormolu and mirror. "The Pier table was inspired by the Empire style, a late 18th-to early 19th-century French style introduced during the rule of Emperor Napoleon Bonaparte in France, which became popular in the United States after 1810. It is best characterized by its classical and stately features, including beautiful wood, elegant columns, animal-paw feet, and elaborate, gilded acanthus-leaf ornamentation. This majestic furniture style was popular well into the mid-19th century." My two cents: This is truly classic Regency style! "Folk artist Ammi Phillips was born in Colebrook, Connecticut and began painting portraits throughout the region by 1811. A decade later, the period in which this image of Jane Ann was completed while the artist was working in Dutchess County, New York, his portraits became more sophisticated due in part to his interest in realism and the natural world. Phillips also began to experiment with dark backgrounds, which provided a dramatic contrast to this sitter's pale skin." My two cents: Notice the lower waist line and wide sleeves, elaborate curls and poufed hair--definitely late Regency style. George IV (previously the Regent) would reign for one more year after this portrait was painted. He died January, 1830. This is earlier than the previous portrait, definitely Georgian. Unfortunately my photo of the provenance for this portrait did not come out, so I can give no information regarding the artist, location it was painted, or exact year. 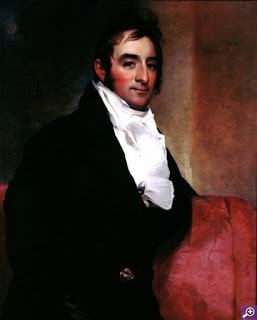 "A portrait painter, Ralph Earl was a prominent southern New England portraitist who carried on the high standards set by John Singleton Copley. (1738-1815). Earl was trained in England. The little brass plate (which you can see along the inset of the frame on the bottom) says, "MICHEL." Unfortunately that is all the information I have on this lovely scene. My photo of the provenance is too blurry to read! FRENCH CABINET, c. mid 19th-C.
"Nineteenth-century French craftsmen excelled at designing and fabricating furniture with intricate combinations of luxurious materials. This cabinet was almost certainly made to showcase such skills. Signed by Pretot, a little-known Frenchy artisan, its materials include gilded bronze, brass inlay, and rich, dark ebony. The painted flower decorations are attributed to the virtually unknown Franco Joseph Napoleon. The cabinet was likely intended for a hallway or dining room, where it would have been used to store or display the belongings of the wealthy owner." The label identifying the Paris shop where it was crafted is still intact! My two cents: If the manufacturer was founded in 1790, I find it interesting that they date the pieces to 1785! You might say they were crafted before their time. No information on this one, but it is certainly majestic. I can't be sure until I return to the museum, but I think this is by Sir Joshua Reynolds. An imposing Regency personage, methinks, with a respectable cravat. 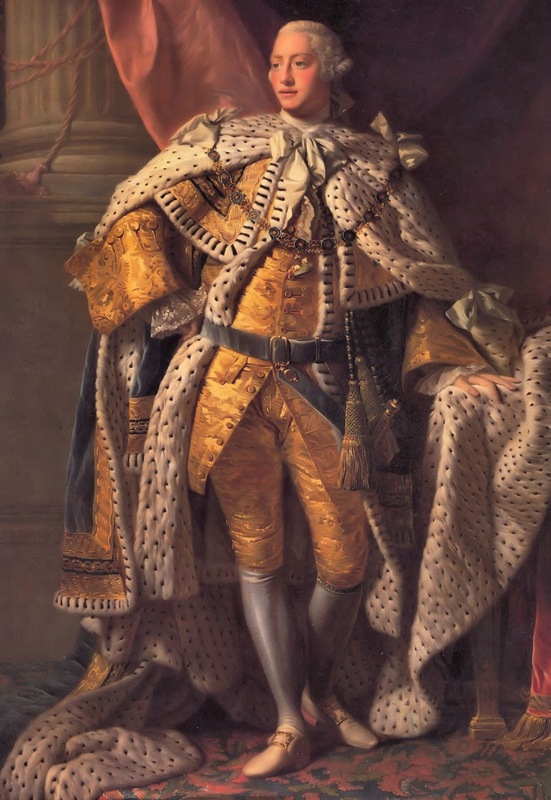 "Reynold’s full-length portrait of the elegantly dressed English nobleman exemplifies both the brilliantly painterly skills that made him one of the most sought after portraitists of his age, and the luxury enjoyed by England’s richest noble families in the eighteenth century. The artist captures Henry with all the signs of his status: his peer’s robes, the crown of a Lord Baron resting on the parapet, and an aloof, if noble, bearing." Silver looks more like gold here, but I can't tell if its my photo or if it had such a golden sheen in the case. Possibly the "tarnish" of the silver gives it the golden hues. Not much "younger" than the tea set above, the silver here is noticeably whiter. Sir Richard Cosway (1742-1821) Watercolor on ivory set in gold box. Cosway was the premier painter of miniatures of his day. I was so excited to see one of his tiny masterpieces in a Dayton collection! This is certainly Georgian, and most likely no more than 2-2 1/2 inches in length! I have a book on Cosway's miniatures--if I can find it before this post goes live, I'll double-check the measurements. Not my photo--this came From the DAI website. I had a poor picture of the provenance only. I hope you've enjoyed these pictures of art and artifacts from the Georgian and Regency eras. For myself, it is hard to get enough of them. Stay tuned as I re-visit the regency in other ways in coming months here at Heroes, Heroines and History! 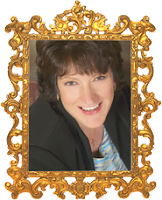 Linore Rose Burkard is best known for regency romance novels with Harvest House Publishers, and now writes YA/Suspense as L.R.Burkard. Linore teaches workshops for writers, is a mother of five, and still homeschools her youngest daughter—preferably with coffee in one hand, and iPad in the other. Linore's newest novel, RESILIENCE, the action-packed sequel to PULSE, is available now for pre-order on Amazon. Some gorgeous pieces. Thanks for sharing. You're so welcome. Thanks for coming by to enjoy them!